Supporters say the bills would reduce fraud at the polls, but critics say fraud barely exists and the measures would discourage voting. AUGUSTA — A pair of bills aimed at tightening Maine’s voter identification requirements were broadly panned as unconstitutional and unneeded Wednesday during daylong public hearings before the Legislature’s Veterans and Legal Affairs Committee. The bills, “An Act to Require Photo Identification to Vote” and “An Act to Protect Voting Integrity by Establishing Residency Verification Requirement for Purposes of Voting,” drew criticism from civil rights groups, top election officials, the state’s attorney general and everyday citizens. Also testifying against the bills were at least a dozen students from Bates College. The Lewiston school has been the target of ongoing criticism from conservatives in Maine, including Republican Gov. Paul LePage, who has suggested that college students have been improperly or illegally voting in Maine elections. Maine is one of 16 states that do not have laws requiring voters to present IDs or documentation to prove identity. Other New England states without voter ID laws are Vermont and Massachusetts. A total of 34 states have laws requesting or requiring voters to show identification at the polls. Half of those ask for photo IDs, and half ask for other documentation. New England states with voter ID laws are New Hampshire, Connecticut and Rhode Island. The 34 states with voter ID laws include West Virginia, where a new law will take effect in 2018, and North Carolina, where a 2013 law was struck down in court and is the subject of an appeal. Debate over the bills, sponsored by state Rep. Bradley Farrin, R-Norridgewock, and Rep. Kenneth Fredette, R-Newport, mirrors activity in state legislatures around the United States against the backdrop of President Trump’s claims that millions voted illegally in the last election. Trump and others who have asserted widespread voter fraud have provided no proof of their claims, and top state election officials around the country, both Democrat and Republican, say their voting systems are sound and that fraud in the polling place is virtually nonexistent. Supporters of the bills say the measures are meant to ensure the integrity of Maine’s election system. Opponents, however, say the requirements will discourage voting and disenfranchise those who have a right to vote. LePage has charged college students with voting illegally and openly questioned the integrity of Maine’s election system, including official statements meant to verify election results. LePage’s claims have been refuted by Maine’s top election officials, including Maine Secretary of State Matthew Dunlap, a Democrat. “The citizens of Maine can be fully confident that their votes are counted accurately and the results reflect the will of the voters,” Dunlap said in December. Still, Fredette said Wednesday that there are “gaping holes” in the state’s laws surrounding residency requirements and voter identification, and that students at the University of Maine were allowed to register and vote with only a student identification card and a bill with their on-campus address printed on it. Fredette’s bill, L.D. 155, includes requirements that local registrars of voters verify a student’s residency when they register to vote using an on-campus or dormitory address. The bill also would require that a student voter show a state-issued driver’s license with the same address on it, or a copy of a motor vehicle registration with the same address, or proof the voter has paid either income or property taxes in Maine. Fredette said he applauded the students who wanted to come forward and be part of the Democratic process, but lawmakers had a responsibility to uphold the state’s constitution, which speaks to the qualifications for being a voter and addresses residency specifically. Fredette said citizens have responsibilities when it comes to voting, and that placing additional requirements on college students who want to vote was not too much of a burden. But some on the committee noted that voters, especially younger ones, may only become engaged closer to the election and they still retained a fundamental right to vote. “Young people are impulsive, and should (a voter) be precluded from being able to exercise his vote for president of the United States because he decided one day ahead or even 15 minutes ahead of time to do this?” asked Rep. John Schneck, D-Bangor. Rep. Craig Hickman, D-Winthrop, said circumstances of life, like a divorce or the death of a loved one, sometimes force people to relocate numerous times in a single year. He said the law doesn’t prohibit people from being registered to vote in different locations as long as they vote only once. “So why would we make it any different for students than we would for any other grown person in the world who chooses to vote where they currently live?” Hickman said. Farrin’s bill, L.D. 121, includes requirements that all voters provide a photo identification at the polls. It also would require the state to provide a free photo identification card for voting to those who may not hold a driver’s license or other type of photo identification. 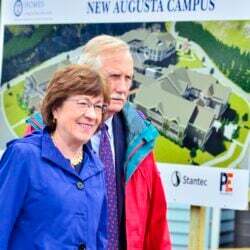 Both bills face formidable opposition, including from Dunlap’s office, Maine Attorney General Janet Mills and advocacy groups like the American Civil Liberties Union of Maine and AARP Maine. Among other concerns, opponents said requiring photo identifications, even if they are provided free, could disproportionately prevent older voters from going to the polls because it can often be difficult to locate all the supporting documentation, such as a certified copy of a birth certificate, required to obtain a photo identification. Those registering to vote for the first time in Maine are required to provide some proof of identification and residency, although a photo identification is not required. At least 34 states have residency and identification requirements for voting, according to a 2016 report by the National Conference of State Legislatures, but only eight states have strict photo identification laws and most states allow voters to cast a provisional ballot if their residency or identification is in question. State Sen. Shenna Bellows, D-Manchester, a former executive director of the ACLU of Maine, also opposes the bills and pointed to previous state investigations that showed there was little to no evidence that voter fraud was occurring in Maine. Deputy Secretary of State Julie Flynn said photo identification laws are largely designed to protect against voter impersonation, which has never been discovered in Maine. Flynn also said that in her 22 years at the Secretary of State’s Office and in various reviews of voting records there have been only four cases in which a voter was able to cast two ballots. She said the photo identification bill would be costly to implement, would cause additional delays at the polling place and would likely create more problems than it would solve. “We believe this bill presents a solution for which there is no documented problem,” Flynn said. She said the Secretary of State’s Office was unable to match some 202,000 registered voters to a state identification card or driver’s license, meaning the state could have to provide that many ID cards to eligible voters if the photo identification bill is made law. Flynn estimated that at $2.80 per card, it could cost the state as much as $580,000. She said other costs would be passed on to the state’s nearly 500 municipalities, which are largely tasked with running elections, and stricter identification laws would take more time at the polls and require additional staff at the local level. Those testifying against the bills overwhelmingly outnumbered the handful of people who testified in favor of them. Supporters of the bills said it was not unreasonable to require a voter to provide photo identification, a common practice while conducting other legal transactions in Maine, including purchasing alcohol and tobacco or cashing a check. The bills will return to the committee in the weeks ahead for a work session, when changes could be made through amendments and lawmakers will vote to recommend that the full Legislature either adopt or reject the proposed law changes.